I have an extra piece of news for you this week to spread the word about an exclusive new font that has been launched by the talented designer Lisa Glanz. Salt and Pepper is a tasty combination of script and sans-serif typefaces that perfectly complement each other. They go together like… Umm… salt & pepper! The script font has a delicate appearance with dainty curls and comes packed with swashes, ligatures and ornaments to fully decorate your typography. It also includes both a subtly textured and smooth version, so you have the choice to go for the full rustic aesthetic with no extra work required. This elegant script pairs nicely with the Salt and Pepper sans-serif typeface, which features a neat hand drawn appearance to match the whimsical style for taglines and slogans. Also included is a collection of 60+ bonus illustrations and a selection of grainy textures so you have a full set of matching assets to create the most dashing designs! The Salt and Pepper font is only available at the Design Cuts store, so you won’t find it anywhere else! What’s more, for the next 24 hours it’s available with almost 50% off at $10, before it rises to its regular price of $19. That’s a fantastic resource for the money, but the discount is an extra bonus for the early birds who are around in time to catch the worm! We’ve also arranged an extra treat for Spoon Graphics readers. One lucky person will receive every other item from Lisa Glanz’s store within the Design Cuts marketplace completely free! This means you could also get your hands on Lisa’s other beautiful font, her massive graphics toolkits and the popular watercolor collections. Simply add a comment to this post giving a brief insight into what made you buy the Salt and Pepper font, or what you like about it. The winner will be drawn at random in 7 days time (Tuesday 12th April 2016). 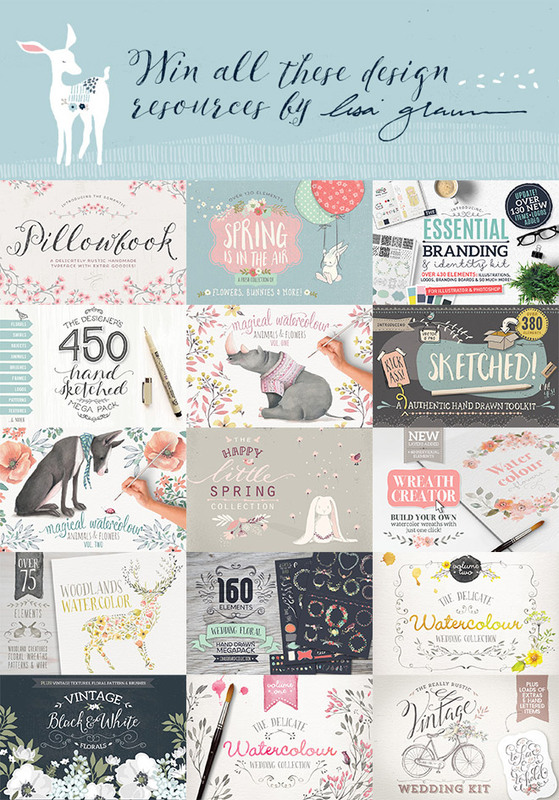 Congratulations to Jessica, who was drawn out as the winner of Lisa Glanz’s complete collection of premium design resources from her store within the Design Cuts Markeplace. I hope you enjoy your new goodies! I love all of Lisa Glanz work!!! I want to use the font for my wedding invitation. I love Lisa Glanz’s work! How fun that the salt & pepper font has both script and sans serif versions that work so well together. I am getting this to design my own wedding invitations for my upcoming nuptials! Lisa’s work is fabulous! I have her Magical Watercolors Vol 3 and I looove it! This font is excites my creativity ! This is the first time I’ve seen Lisa’s work! I am so impressed by her work and I will be purchasing this font today! Happy. These are all happy, and I could definitely see using this style on my own art website. Caahh…ute!!!! Can’t wait to start using it! They are totally tasty and I couldn’t resist the tremendous temptation to buy! Salt & Pepper is beautiful yet spunky… LOVE! All the extra swashes, textures, and styles make this a really good deal! What a cute font to go with her equally cute and whimsical illustrations! Lisa is a talented individual! I keep finding myself coming back to Lisa’s work! The Salt and Pepper font is just another example of her exquisite work, attention to detail and versatile applications of all her resources. I may have drooled a little when I saw this! Salt & Pepper is brilliantly named – a perfectly delicious font to sprinkle here and there. I’m planning to use it to spice up my blog, which is about farm to fork cooking and related topics – what could be tastier? Love the swashes and extras, too, like having some of those yummy flavored salts and exotic peppercorns to play with. Thanks, Spoon Graphics! All of Lisa’s work is so eye-catching and fun! Who wouldn’t want to use it? I didn’t hesitate to snap up Salt and Pepper. The Salt N’ Pepper fonts are salty & hot! Perfect for new designs and trends! Love the Salt and Pepper look, perfect for todays trends with invitations, social stationery and especially weddings ! So versatile and pretty ! I love Lisa’s work! And as for the salt n’ pepper fonts–I really like the rustic and smooth options, plus that little swoop on the san serif O.
I absolutely adore this font! The flourishes are perfect, and I love the way the letters connect into a classy scribbled font. It would go perfect with floral accents. I would love to use this font with my Cricut machine to make a quote for the wall in my bedroom! I bought this font because I love the versatility and how it has script and sans serif versions. Love Salt & Pepper because it’s so whimsical and charming! Love Lisa Glanz’s designs, thanks for this great offer. The flourishes, balance and ability to connect the letters in Salt&Pepper make it so useful and attractive, and I love having the rustic and smooth versions. I envision using Salt&Pepper for invitations to an upcoming fundraiser/luncheon (great timing, thank you!) and for a save-the-date wedding card. There’s so much I could use the Salt & Pepper font for. I love how its flouncy script style is in right now, so it’s versatile for everything from blog graphics to invitations, also social media graphics. Pretty, but not fancy. 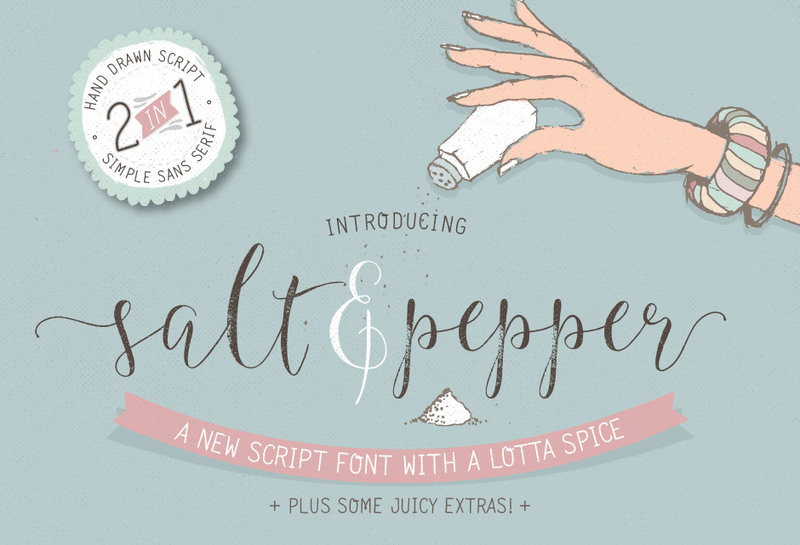 The Salt and Pepper font by Lisa Glanz is absolutely beautiful! I LOVE that it supports international characters (espacially that the German letter “ß” is included!). The bonus goodies are great, too! Everything is AWESOME! Beautiful hand-made font. I love the combination of the script and sans-serif type, lots of versatility while remaining effortless. I love everything by Lisa Glantz, especially this font. I appreciate the script and sans-serif type that pair together effortlessly. All of Lisa’s work is just gorgeous (and so is her accent – did you watch the Salt & Pepper video?!? Love it!). I particularly love the font pairing in this one, and the option to have rustic or smooth – it’s a really versatile, beautiful font! Here a font! There a font! A Lisa Glantz font, Bonus!! Love that this is a set of fonts, it can be difficult to find a nice simple font to pair with fun, light script fonts! I loved the delicate sense from this typeface. Very feminine! LOVE IT! Thanks so much for sharing…can’t wait to start using this font and these gems in my designs! I know my clients will be in love too! I really like the beautiful hand drawn style of her designs, and her illustrations remind me of every great children’s book I’ve ever read, it just kind of puts you in a happy place. I love everything about the work of Lisa Glanz, Design Cuts is brilliant too! I’m so glad I bought the font in the half price deal. It’s so versatile, beautiful and readable, what a bonus to receive a sans serif version and some extra gorgeous bundle bits too! I love how light and airy the font and all her designs feel! Beautiful! I love how sweet her designs are. The bunny is adorable!! Truly beautiful. I am delighted with Lisa’s work! So adorable and full of whimsy! Love her work. I have bought some of her designs from Creative Market. Unfortunately Design Cuts has payment services that don’t accept all cards. So unless Salt & Pepper goes up for sale at Creative Market or on her Etsy shop, then I won’t be able to buy it. A shame because it’s a really beautiful font. I just love how handmade all her items are! thank you for the generous opportunity! I love Lisa’s work – what talent! I love these new set of fonts. Thanks for sharing all your talent. salt and pepper is really exciting named. All the extra swashes, textures, and styles make this a really amazing deal. loved it.